This post is sponsored by Unilever. 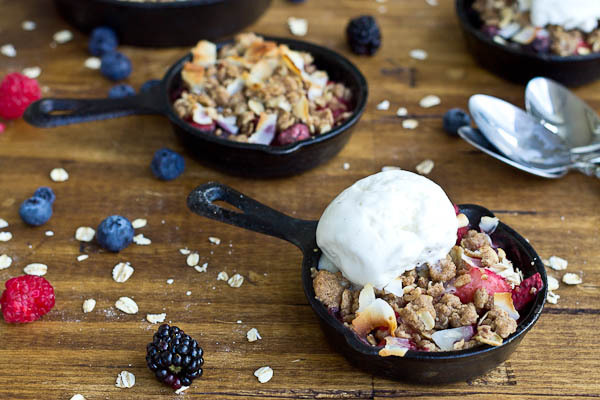 Soak up the last of summer with this Skillet Mixed Berry Oatmeal Crisp. Blueberries, raspberries, strawberries, and blackberries nestled under a warm oatmeal crisp topping and a scoop of Breyers® Natural Vanilla ice cream. So good! Happy Friday, friends! This week I’m soaking up (and eating up) the last of summer before I get into full on fall mode. Neighbors, the Halloween decor is going up next week so be ready. I’m always on the edge of my seat when fall rolls around and you can bet on it that my pumpkin spice candle that has been burning since mid-August. Maybe this frenzy is because we don’t technically get fall here in central Florida, so I try to make up for the fact that the weather may never cool off with my festive fall decor. Or maybe it’s just because fall marks the start of the most wonderful time of the year. So, I’ll just crank down the AC and get all happy about the house feeling fallish and smelling like pumpkin bread. While we still have the goodness of summer produce at our fingertips, we need to grab a spoon and soak up the last of summer with this Skillet Mixed Berry Oatmeal Crisp. Ya’ll this would be amazing with pretty much any fruit (sliced apples, peaches, pumpkin ← there I go again!) thrown under that crisp layer and topped with Breyers® Natural Vanilla ice cream!! Like everything is better a la mode, right?! Ice cream is quite possibly my favorite food group. 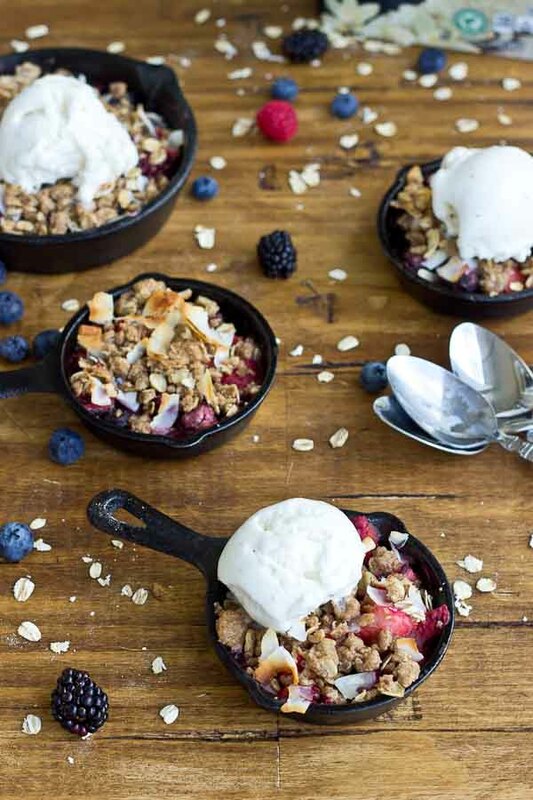 I’m thrilled to be partnering with Unilever this year as one of their Agents of Change to bring you this Skillet Mixed Berry Oatmeal Crisp recipe topped with Breyers® Natural Vanilla Ice Cream. I grew up eating Breyers®. It’s important to me that their ice cream is made with high quality and simple ingredients like fresh cream, sugar, and milk. What’s more, their milk and cream are all American and come from cows not treated with artificial growth hormones*. To me, a good ice cream has a bold vanilla flavor. I love vanilla beans!! 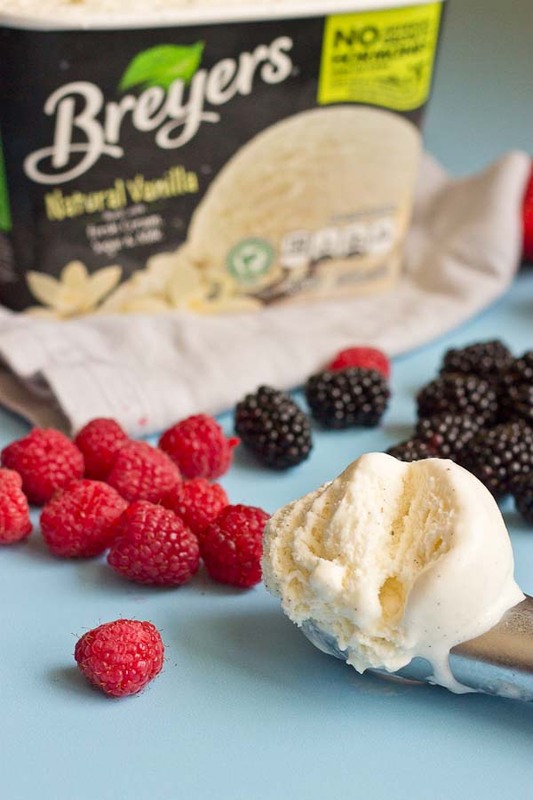 Fun fact, every little speck of vanilla bean you see in Breyers® ice cream comes from 100% Rainforest Alliance Certified™ vanilla beans, sustainably farmed in Madagascar. All the more reason to eat ice cream right? I hope you enjoy a big scoop on top of this Skillet Mixed Berry Oatmeal Crisp! So I’d love to know, are you trying to hold onto the last of summer or have you already moved on to pumpkin and started decorating for fall and Halloween? Preheat oven to 375 degrees Fahrenheit. Coat four 3.5-inch cast iron skillets with butter or cooking spray. Place skillets on baking sheet. Prepare berries by slicing strawberries and blackberries into uniform “bite sized” chunks, leaving blueberries and raspberries whole. In a medium sized bowl, toss together berries, lemon juice, cinnamon, flour, vanilla extract and sea salt until berries are coated. Set aside. In a separate medium sized bowl, mix together oats, flour, brown sugar, butter, vanilla, cinnamon, and salt. Work with your fingers to mix butter throughout, topping should be crumbly. Toss in coconut flakes. Divide berries evenly among the skillets and top with oatmeal crisp layer. Place baking sheet with skillets in the oven and bake for 12-15 minutes until crisp and coconut turns golden brown. Remove from oven and allow to cool for 5 to 10 minutes. Top each with ½ cup scoop of Breyers® Natural Vanilla ice cream. *Suppliers of other ingredients such as cookies, candies & sauces may not be able to make this claim. The FDA states that no significant difference has been shown between dairy derived from rBST-treated and non-rBST-treated cows. This dessert is the perfect last minute summer dish to use up fall berries! 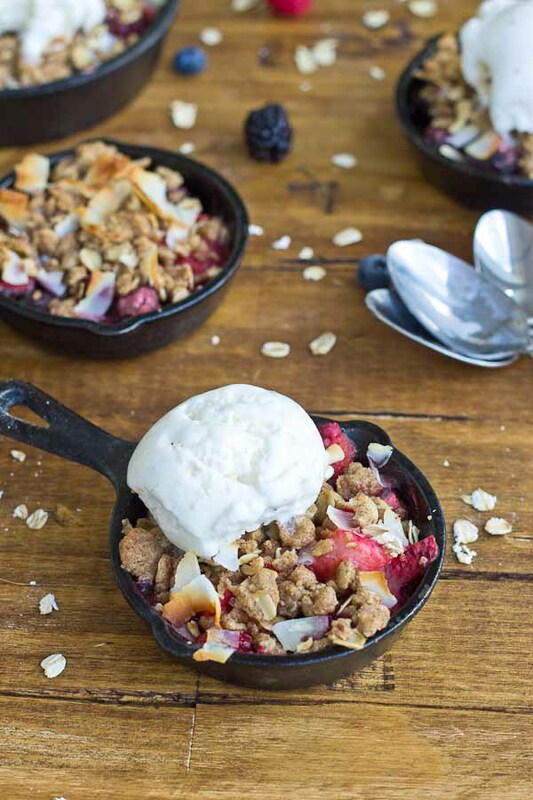 While I’m ready for fall to begin, I could never pass up a nice berry crisp with vanilla bean ice cream! Thanks Bethany! I’m loving it too. Mission.. eat up all the berries!